Bicycle highways, a new transport experiment, are spreading fast across the European Union, notably in Denmark, Germany, Sweden and the UK. In the suburbs of Copenhagen, a bicycle highway project launched in April last year has proven a hit with the city's commuters. Authorities plan to open 28 bicycle highways in total. According to its promoters, bicycle highways should be rolled out across the EU, especially in a time of crisis as they can help governments save on healthcare costs. The bicycle network is currently saving the Danish state an estimated €40 million per year in health costs, with only a relatively small amount of money going to building and maintaining the highways. Lars Gaardhøj, chairman of the Environment and Green Growth Committee in the capital region of Denmark, told EURACTIV that the bicycle highways targeted commuters who traveled more than five kilometres to work or school. Studies have shown that over distances more than five kilometres, people tended to choose other means of transport, like buses or cars, he said. 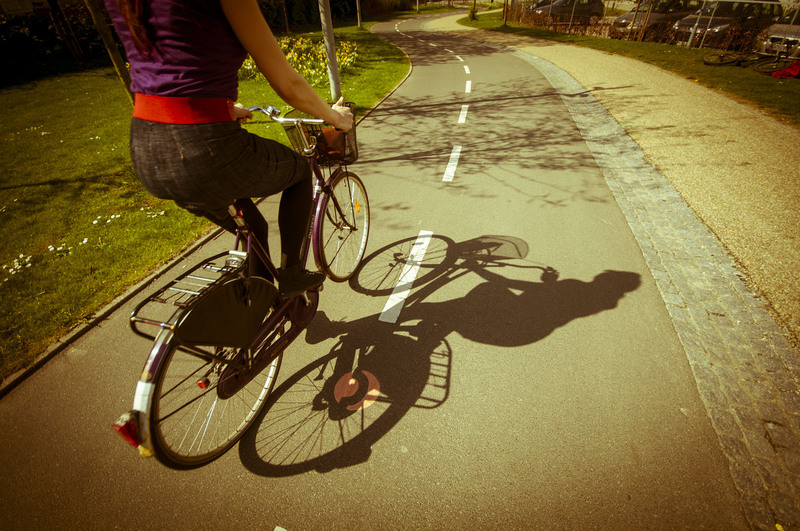 What is a bicycle highway? Gaardhøj explained that the big difference between a bicycle highway and a bike lane is that highways are maintained and prioritised just like normal roads are. This means the bike paths are as straight as possible, making them faster. Normal bike lanes usually meander where there is space available for them, which may prove cumbersome to cyclists. The paths are also broader and during winter, snow will be removed from them, as with regular roads. "Everyone said there has to be better bike lanes, better lightning next to the bike paths, it has to go fast and the snow must be removed quickly," Gaardhøj said. "This is what we are trying to address, making some long bicycle highways where you can ride safely in good lightning and where the necessary equipment is close to you," he added. Comfort has also been thought through, with air pumps placed every 1.5 kilometres. And when you get closer to the city centre, traffic lights have been coordinated in “green waves” so that cyclists who keep a speed of 20 kilometres per hour will only meet green lights. "We have tried to avoid cross roads," Gaardhøj explained. "Of course this is challenging in the inner city, but if you are in the suburbs, you’ll have many kilometres without stops." Gaardhøj said the project's designers had tried to figure out how to encourage people to bike more than five kilometres for their daily commute. The first bicycle highway, inaugurated a year ago, has quickly generated a 10% rise in the number of commuters who choose to bike from the suburbs to Copenhagen, a distance of 15 kilometres. "This shows that what we investigated actually is true," Gaardhøj stated. Jakob Lisbjerg, a 38-year-old Copenhagener, said that he tried one of the bicycle highways "for fun" as he had read a lot about the new initiative, and liked to bike. However, there was still room for improvement on the highways, he said. "I don't think that they [the bicycle highways] are much better than average bike paths," Lisbjerg told EURACTIV, adding that clear signing and the quality of the roads were lacking in some areas. Gaardhøj argues that Copenhagen's congestion not only boosts CO2 emissions, it also leads to significant productivity losses as people sit and wait in traffic rather than spending time at work. The health benefits of cycling are also invaluable, he says. "We know that the Danes are becoming fatter, they don’t exercise enough, they drink too much, they smoke too much… In this picture biking fits in perfectly. People who bike become healthier," Gaardhøj stated, adding that cycling benefits are estimated at 336 million Danish crowns (€40 million) in healthcare costs each year. There are also health benefits related to reduced congestion and air pollution, he believes. "We know that when people become healthier, especially older people, fewer will develop problems with breathing infections that demand treatment. There are a lot of things where we get treatment today which we can reduce significantly. This makes direct and concrete reductions of costs in our health budget," Gaardhøj said. Polis, a network of European cities and regions promoting sustainable mobility, has long championed walking and cycling to save on healthcare costs, as well as reducing pollution and congestion. The network says that while there are a number of European policies acknowledging the link between transport and health, there is a need for more initiatives, including by EU institutions, to actively promote the health benefits of active travel. Florinda Boschetti, a project manager at Polis, said cities are sending a clear message. "They are removing some of the investment from car-centred policies to environment and cycling-friendly policies. It's a good sign especially in times of crisis. [The] cost of fuel is increasing and affordability is decreasing," Boschetti told EURACTIV. Besides Copenhagen, Berlin has also launched 12 bicycle highways. London is preparing to establish the same number of highways, and Sweden's transport authorities have approved a four-lane bike highway between Malmö and the nearby university town of Lund. Tim Crayford, president of the Association of Directors of Public Health in the UK, argues that in order to decrease obesity levels, local authorities have to move beyond rhetoric. "We need to see a visible investment in infrastructure that makes cycling and walking the travel modes of choice,” he said. Though the European Commission is funding a lot of bicycle projects, many EU cities need more information on urban mobility and the opportunities of funding for infrastructure for cycling. "The opportunities are there, but maybe a little bit more information would help some member states," Boschetti said. According to Boschetti, cities have no excuses not to promote cycling – even if they are sited on bumpy terrain. "Having some hills can't be seen as a barrier. Nowadays there are different types of bicycles. For example electric bikes can encourage people to take up bicycling. They can give a boost and give for example seniors a little help to keep on cycling," Boschetti said. In Copenhagen, Gaardhøj said that the success of the bicycle highways was partly due to an already established cycling culture, but any city could achieve cycling success with a little bit of effort. "There is already a positive sentiment for bicycles in Denmark and we don't witness this at the same level in many other places, but we have also seen in Denmark that if nothing is done for bicyclists to create good conditions, then fewer and fewer people bike," he said. Cycling offers benefits for individual and for society as a whole. For individuals, cycling is healthy, flexible and fast. For society, a large number of cyclists increases the smooth flow of traffic, reduces congestion and pollution, and brings societal health benefits as a result of increased exercise. Nice to see Euractiv doing a piece on cycling. A lot of EU media and policy makers don’t take cycling seriously and as such don’t understand that cycling can actually save a lot of money in health care costs and infrastructure. With tight budgets, and big budget negotiations taking place in Brussels, it should be easy to see that investment in cycling is a win-win for everyone. Good! And for cities with steep gradients, can we have ski-style T-bars for hill climbing? @Ian McFarlane: In cities with steep gradients residents are advised to use electric-assist bicycles. Cycling roads are allready built(highways and freeways). Car traffic remove to railways so we can use wide roads for biking. I would like to try this for a day. C’mon Let Me Ride your bicycle ! What about the rising numbers of traffic accidents regarding bicycles recorded in Sweden? Single vehicle accidents with severe personal injuries to the unprotected traveller. What about workplaces needing new facilities for staff? We used to sweat at work and shower afterwards. Nowadays we shower before work to not embarrass our co-workers and customers. What about disabled, weak and elderly people? No chance of working? What about transport on rails and tracks? Forget it! That has never been an efficient or effective way for personal transport. Never will be. The automobile is still the most practical means of personal transportation invented. There is just no way around that fact. What ever dreams enthusiasts may hold. Good that Euractiv is giving attention to a transport mode that can indeed have positive effects on public health in EU member states. It’s just a pity that the author missed the opportunity to mention my native country, the Netherlands, where bicycle highways are indeed developing fast as well, in addition to the already impressive continuous network of ‘fietspaden’, a fixed item in urban planning since decades. Also, in many EU member states, Dutch embassies are actively involved in the promotion of ‘bicycle culture’ in their respective host countries. Bicycle highways in the UK? Where? There aren’t any around here, dream on.